The model is a part of the applications library. The HTTP model is based on a commonly used 3GPP model in standardization . This traffic generator simulates web browsing traffic using the Hypertext Transfer Protocol (HTTP). It consists of one or more ThreeGppHttpClient applications which connect to a ThreeGppHttpServer application. The client models a web browser which requests web pages to the server. The server is then responsible to serve the web pages as requested. Please refer to ThreeGppHttpClientHelper and ThreeGppHttpServerHelper for usage instructions. an embedded object, e.g., an image referenced by the HTML file. 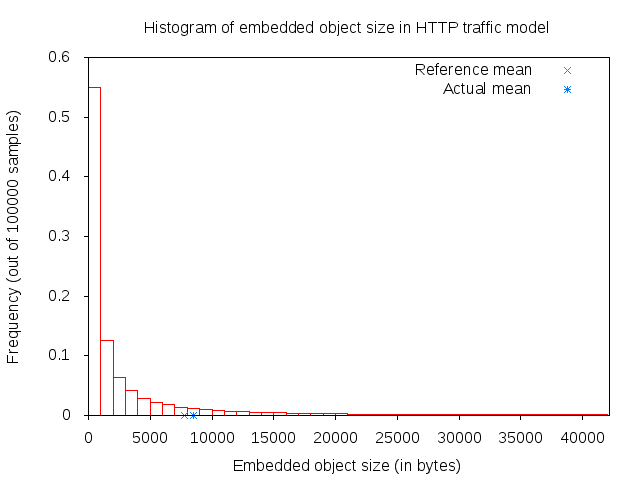 The main and embedded object sizes are illustrated in figures 3GPP HTTP main object size histogram and 3GPP HTTP embedded object size histogram. A major portion of the traffic pattern is reading time, which does not generate any traffic. Because of this, one may need to simulate a good number of clients and/or sufficiently long simulation duration in order to generate any significant traffic in the system. 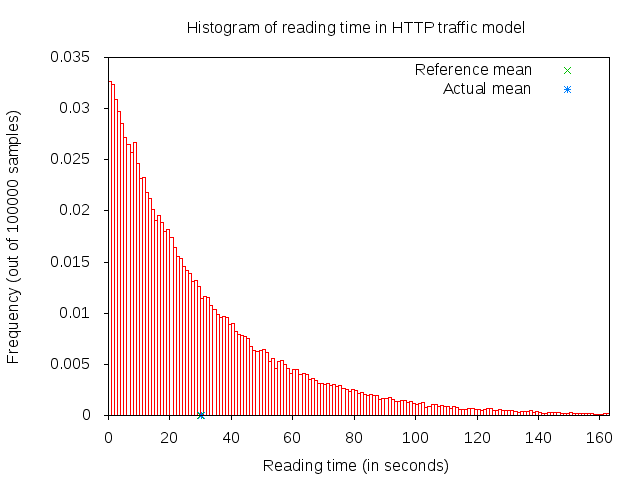 Reading time is illustrated in 3GPP HTTP reading time histogram. 3GPP HTTP server is a model application which simulates the traffic of a web server. This application works in conjunction with ThreeGppHttpClient applications. The application works by responding to requests. Each request is a small packet of data which contains ThreeGppHttpHeader. The value of the content type field of the header determines the type of object that the client is requesting. The possible type is either a main object or an embedded object. The application is responsible to generate the right type of object and send it back to the client. The size of each object to be sent is randomly determined (see ThreeGppHttpVariables). Each object may be sent as multiple packets due to limited socket buffer space. To assist with the transmission, the application maintains several instances of ThreeGppHttpServerTxBuffer. Each instance keeps track of the object type to be served and the number of bytes left to be sent. The application accepts connection request from clients. Every connection is kept open until the client disconnects. Maximum transmission unit (MTU) size is configurable in ThreeGppHttpServer or in ThreeGppHttpVariables. By default, the low variant is 536 bytes and high variant is 1460 bytes. The default values are set with the intention of having a TCP header (size of which is 40 bytes) added in the packet in such way that lower layers can avoid splitting packets. The change of MTU sizes affects all TCP sockets after the server application has started. It is mainly visible in sizes of packets received by ThreeGppHttpClient applications. 3GPP HTTP client is a model application which simulates the traffic of a web browser. This application works in conjunction with an ThreeGppHttpServer application. In summary, the application works as follows. Upon start, it opens a connection to the destination web server (ThreeGppHttpServer). After the connection is established, the application immediately requests a main object from the server by sending a request packet. After receiving a main object (which can take some time if it consists of several packets), the application “parses” the main object. 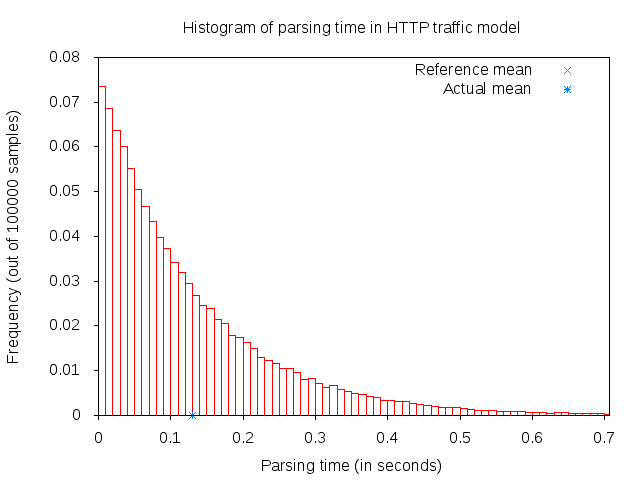 Parsing time is illustrated in figure 3GPP HTTP parsing time histogram. The parsing takes a short time (randomly determined) to determine the number of embedded objects (also randomly determined) in the web page. 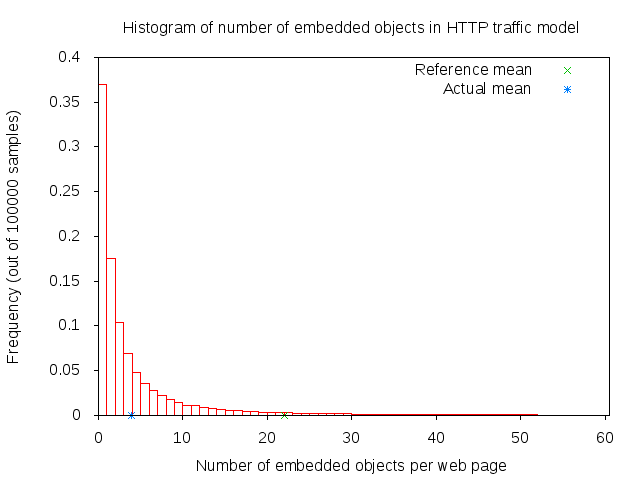 Number of embedded object is illustrated in 3GPP HTTP number of embedded objects histogram. the first embedded object from the server. The request for the next embedded object follows after the previous embedded object has been completely received. Reading time is a long delay (again, randomly determined) where the application does not induce any network traffic, thus simulating the user reading the downloaded web page. After the reading time is finished, the process repeats to step #2. The client models HTTP persistent connection, i.e., HTTP 1.1, where the connection to the server is maintained and used for transmitting and receiving all objects. Each request by default has a constant size of 350 bytes. A ThreeGppHttpHeader is attached to each request packet. The header contains information such as the content type requested (either main object or embedded object) and the timestamp when the packet is transmitted (which will be used to compute the delay and RTT of the packet). IEEE 802.16m, “Evaluation Methodology Document (EMD)”, IEEE 802.16m-08/004r5, July 2008. NGMN Alliance, “NGMN Radio Access Performance Evaluation Methodology”, v1.0, January 2008. 3GPP2-TSGC5, “HTTP, FTP and TCP models for 1xEV-DV simulations”, 2001. The three-gpp-http-example can be referenced to see basic usage of the HTTP applications. In summary, using the ThreeGppHttpServerHelper and ThreeGppHttpClientHelper allow the user to easily install ThreeGppHttpServer and ThreeGppHttpClient applications to nodes. The helper objects can be used to configure attribute values for the client and server objects, but not for the ThreeGppHttpVariables object. Configuration of variables is done by modifying attributes of ThreeGppHttpVariables, which should be done prior to helpers installing applications to nodes. The client and server provide a number of ns-3 trace sources such as “Tx”, “Rx”, “RxDelay”, and “StateTransition” on the server side, and a large number on the client side (“ConnectionEstablished”, “ConnectionClosed”,”TxMainObjectRequest”, “TxEmbeddedObjectRequest”, “RxMainObjectPacket”, “RxMainObject”, “RxEmbeddedObjectPacket”, “RxEmbeddedObject”, “Rx”, “RxDelay”, “RxRtt”, “StateTransition”). Building the applications does not require any special steps to be taken. It suffices to enable the applications module. By default, the example will print out the web page requests of the client and responses of the server and client receiving content packets by using LOG_INFO of ThreeGppHttpServer and ThreeGppHttpClient. The test consists of simple Internet nodes having HTTP server and client applications installed. Multiple variant scenarios are tested: delay is 3ms, 30ms or 300ms, bit error rate 0 or 5.0*10^(-6), MTU size 536 or 1460 bytes and either IPV4 or IPV6 is used. A simulation with each combination of these parameters is run multiple times to verify functionality with different random variables. 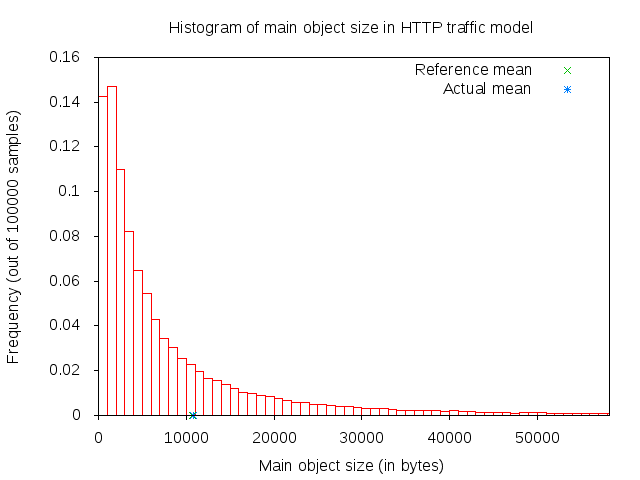 Test cases themselves are rather simple: test verifies that HTTP object packet bytes sent match total bytes received by the client, and that ThreeGppHttpHeader matches the expected packet.